The drive from Pogradec to Korca was pretty uneventful, or so I am deducing because I do not remember anything from it. 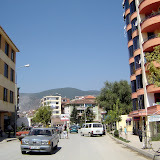 Once in Korca, I was shocked at how bare the city looked baked in the sun. And then I remembered that Korca is a city whose center is off-center. It’s full of beautiful houses and monuments which are hidden in narrow alleys and semidetached neighborhoods. I have lots family in Korca, but I’ve never paid attention to where they live, or the nice parts of the city that they’ve shown me because I’ve always passively followed people to places and I’ve never actually led the way. We found the city looking upside-down, or inside-out to be more accurate, because the municipality was redoing all the pipes across town. People were cordial when asked for directions, but they had that implied sense of self-importance, typical of Korcars, who assume everyone should know where certain things in their city are, that’s why they gave us directions that were based on us knowing where major buildings or institutions were. Oh well, it’s the Korca way.